Do you have an RSS feed for the blog and Ask Axe Cop Episodes? Hey Axe Cop I have a question for you! 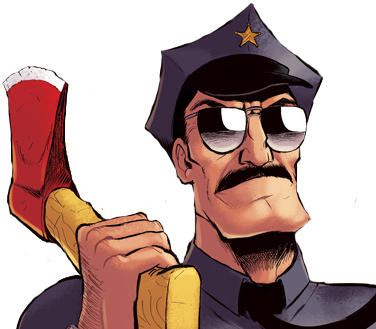 Submit Axe Cop questions via the form at the bottom of this page or on the Contact page and be sure to use the “Ask Axe Cop!” contact type. If you send them via the forum, Facebook, Twitter or any other way, they will not go into the question pile. Does Malachai Actually Write the Script for Axe Cop? Malachai tells me a story, and I ask him questions to fill in the gaps. It’s just an exploration of 5 year old logic… so he says he is an Axe Cop and asks me if I want to join his team. I say yes, he says sign here. I ask him what we are going to do, he says fight dinosaurs. Also, I do not write word for word what he says, I translate it, paraphrase it, and sometimes make sense of it. If you wanted to get technical, you could say Malachai comes up with the stories, then I write it and illustrate it… but I just feel lame trying to cling to my writing credit next to a five year old. I like when comic credits are simple… this guy wrote it, this guy drew it. Why is Axe Cop a Cartoon For Adults? I understand the concern on this one. Axe Cop is written by a kid, and most parents with a sense of humor are OK with their kids reading it. But the cartoon violence in Axe Cop is still simply unsuitable for children’s programming and it would be very hard to make an Axe Cop TV show marketed to little kids. The only way we could make a show that was faithful to the comic was to make it for adults. Like the comic, the show is not gory, there is no swearing, etc. People’s heads pop off like they are toys, it is not a bloodbath, and Axe Cop’s harshest language is “what the heck?!”. Still, Axe Cop is programmed among material that is for adults and parents should be aware of that when tuning in. Luckily you can watch the show online, isolated and not among cartoons that aren’t appropriate for kids. The initial order was for 6, but there are 12 in the works. Of course we hope to make many more than that, but that all depends on how many people continue to tune in. About a month ago we had a bad DDOS attack that put all my web sites down because they share the same server. It was sort of a perfect storm, and due to some mix-ups and miss-communications, we did not have a good backup on hand. The web site was long overdue for a redesign anyway, and I really wanted to switch to a Word Press theme because I love updating Bearmageddon (my other web comic) and I like the simple layout. Axe Cop was designed in ignorance and rushed together. We have learned a lot since we first created it. Unfortunately some content will be lost forever, like the forums (which were rarely used anyway) and the comments. But we have the old site and are working on bringing back as much as we can. The important parts (the comics) are still with us, and that is what mattered to me most. Hopefully, as the TV show launched only days after the new web site, a new group of fans will be able to come in and begin new interactions and continue the community we had built before. Have any other questions? Ask away!